Back in April I wrote about the fact that I had finally relented and procured an eReader. It was interesting adapting to a new form of technology. It was also quite a different reading experience. I found it very easy to use and quickly downloaded several books to read. I also included my wife in this wonderful new addition to our reading regime. I was quite surprised how easily she also took to it. In fact, during the first few weeks we had to share the reader. She usually heads off to bed before me and reads for 20 – 30 minutes, and then when I arrive in bed it is lying there waiting for me. So far, we have not argued over its use at all. Not yet. Well, not so much of a digression but more of an introduction to the review I want to do. The first book I bought and read on my eReader was The Girl with the Dragon Tattoo. When I mentioned this on Facebook many of my friends said how enjoyable this book was, as well as being totally gripping in its exciting subject matter. Yes – I was totally absorbed by the storyline. At times I had trouble putting the reader down. I even took it out in the back yard to read – when the grandchildren allowed me this luxury. We were staying with my son and family in Sydney at the time. The utter fascination with the characters and the events in this novel had me spellbound, and about half way through the book, this began to bother me, and towards the end it concerned me greatly. Certainly it is a very well written novel – no disputing that. I just found that this type of novel is not for me – especially when I have so many other books waiting to be read. And I have resolved not to read the sequels in this series. Good thing I didn’t buy them. I have been planning on writing this article for a few days now, but world events have overtaken me. I just have to write this. The idea for this post started out being a review of a book – and I will do that, but the underlying story is much, much bigger. I was just going to write a simple, straight forward review of a novel for young people, but the news headlines of the last few days shout louder than any review. The people of Syria are experiencing something I can never imagine. War in recent times has ravaged their beautiful country and continues to do so as I write. It is daily in our news broadcasts. I don’t know enough about the politics of the conflict to comment, but I do appreciate the massive humanitarian crisis which has developed over recent months, culminating in very recent events. None can forget the image of the drowned body of a small boy on the beach. His family was one of millions attempting to escape the war zone. Many are heading towards European countries by any means possible. The scale of the tragedy is unimaginable. I cannot imagine a body of refugees the size of a large part of the Australian population migrating in part on foot with only a few hand-held possessions. I cannot begin to imagine what they are going through, the terror they must feel, the sense of dislocation, and the utter hopelessness of their actions. We cannot sit idly by and ignore their plight. Only minutes ago I checked the news, and this morning the Australian Government announced that we will be accepting an additional 10,000 Syrian refugees into Australia. While this is good news, I feel that it is pitifully short of what we could, and should be doing. Double, or triple that amount would be more like it, in my opinion. In the same news bulletin the government announced that it is giving the go-ahead for our planes to join forces in bombing raids on Syria. I, like so many others, despair at news like this. This is not our conflict. Surely Australian involvement can only cause more suffering? 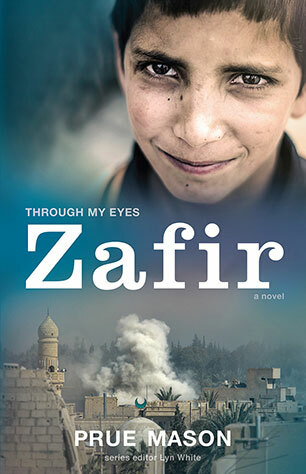 “Zafir” is another in the highly acclaimed series of novels in the “Through My Eyes” series for young adults. This series aims to tell first hand accounts of war zones through the eyes of children caught in conflict. Zafir, a young boy caught in the start of the conflict in Syria a few years ago, grapples with what war means to him, and how it impacts various members of his family. Not only are immediate family members injured, some are arrested and imprisoned without trial and many in the close, loving family are displaced persons in their own country. When Zafir is on his way to school he sees a body dumped from a moving car. He is concerned that nobody stops to help and he is told to forget he ever saw it. The conflict he feels as a result, and the rapidly deteriorating situation politically and socially, brings a nervous uneasiness into his life, and the downward spiral into his family’s displacement begins. Add to this is the conflicting spiritual influences in his life and we observe his whole world collapse around him – literally due to bombing of his home, and metaphorically with the arrest of his father. This is a fast moving, intense story which feels like an action movie, reads like an adventure story, confronts the reader with the reality of war and mirrors today’s newspapers and television news broadcasts. Highly recommended. WARNING: This post is not much about writing. I felt the need to vent a little online. I don’t do it very often. Most of the time I am very calm and don’t let minor things upset, but every now and then something gets up my nose. Then I try to let it slide; life’s too short to let a minor irritation get the better of me. For many years now I’ve had a watch which had a stopwatch facility. Whenever I am writing, or doing research linked to my writing, I have used this facility. At the end of each day I record on a chart how many hours I’ve spent on my writing that day, as well as how many blog posts I’ve written and a word count for the day. These figures are kept as a tally on this chart so I can see if I’m reaching my writing goals. It’s a way of keeping me accountable to myself. Works for me. Just over two years ago I bought a new watch. The old one had seen many years of faithful, reliable service, save for an occasional new battery. The jewellery shop I usually go to no longer stocked the watch, and batteries were no longer available. Time for an upgrade after many years, I thought. The new watch was good, albeit a little bulky/clunky in appearance, but I coped. A few weeks ago the battery failed. Suddenly – right in mid-sentence. So I went to have it replaced – not a problem. It was a few weeks out of warranty, but that wasn’t what upset me. A few days later the rubber/plastic strap threatened to break at any moment. Oh no. Having just spent money on a battery, I wasn’t keen to fork out more for a strap. It would have almost been cheaper to have bought a new watch. So I did. The old watch is still very functional; I just can’t wear it, so it sits on my writing desk still performing nicely in timing my writing patterns. I am determined to get my money’s worth out of that battery. The throw away society mentality really gets up my nose. Built in obsolescence has always pushed my button. And I won’t even start on about having to replace a perfectly good – but very old – mobile phone this last week. SIGH. Life has certainly been tough in most parts of the Australian countryside for more than a decade now. Many rural people have experienced devastating droughts, overwhelming floods, unbelievable locust and mice plagues, raging bushfires, economic downturns and unsympathetic banks. Sadly, many have not coped with the stresses of these disasters and have ended their lives. Suicide is a serious issue in many rural communities, and all it does is solve the problem for the individual, leaving further tragedy and perhaps guilt for those left behind. 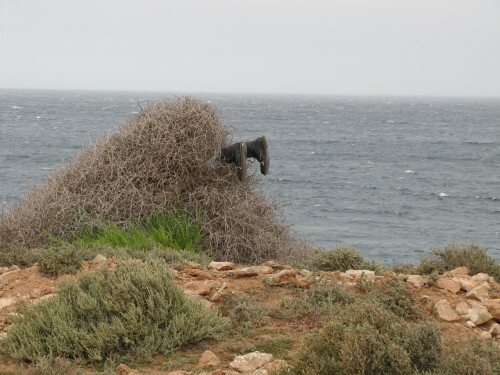 With typical laconic Aussie humour in the midst of all this angst, the poor fellow shown in the photo above couldn’t even get his last act right. Instead of leaping over the cliff to the rocks below, he stumbled into a boxthorn bush. What a harsh way to go! Seriously, although we may laugh at this poor fellow’s tragic and misplaced end, suicide is no laughing matter. If you are experiencing stress, anxiety or depression, or know someone who is, please consult your family doctor ASAP. In the meantime, sites like Beyond Blue here in Australia can be a first step on the path to recovery. There is help available and professionals can show that there is hope in seemingly hopeless situations. This hasn’t always been the case. When I was young three close relatives needlessly took their own lives; they didn’t know where to turn for help. Writers make up a group most at risk. We often work long hours alone, cloistered by necessity. Getting published can be depressingly difficult. Finances can be stretched to breaking point just as our spirits can also break. Be sure to get help if that’s where you’re at. Good writing and good health.